NOTE: Date must be in the form YYYY-MM-DD, like 2019-04-16. Louisville, KY - Gov. Matt Bevin today welcomed the Jobs for America's Graduates (JAG) National Board of Directors meeting to the Commonwealth, as the group convened at the Seelbach Hilton in downtown Louisville. JAG is a state-based national non-profit organization dedicated to preventing dropouts among young people who have serious barriers to graduation and/or employment. Gov. Bevin, who serves on the JAG Board of Directors, welcomed his colleagues from across the nation, as he touted the program's success in the Bluegrass State. 2019-04-16 - Adair County, KY - Photo from the owners. 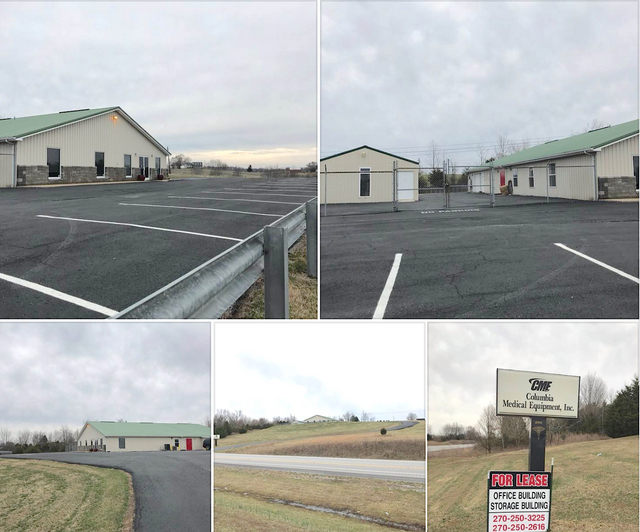 ​FOR LEASE: ​ 5​,​000sf​-​plus ​O​ffice and 1​,​200sf​-​plus ​Storage​ Building​ ​located on North Hwy 55 at 2991 Campbellsville Road, Columbia, K​Y​.​ Formerly Columbia Medical Building.​ Price is negotiable​. ​Please Call ​​270-250-3225​​ or ​​270-250-2616​​. Imogene loved spending time in the library and solving sudoku puzzles. She was a mother to all that knew her. Funeral services will be held at 2pmET on Thursday, April 18, 2019, at McKinney-Brown Funeral Home, 752 Campbellsville St, Liberty, KY, with Bro. Hershel Lawhorn officiating. Burial will follow in South Fork Cemetery. Visitation will be held from 6pmET until 9pmET on Wednesday, April 17, 2019, at McKinney-Brown Funeral Home. Lindsey Wilson baseball falls to No. 2-ranked Tennessee Wesleyan on Tuesday afternoon at Egnew Park. The Blue Raiders (7-29) dropped the game 15-1 against the Bulldogs (38-7) in a game that would result in only seven innings played of the scheduled nine. Tennessee Wesleyan out hit Lindsey Wilson 17-5 as well as produced 14 RBI's to LWC's one. Lindsey Wilson returns to action this weekend as they host Mid-South Conference foe Campbellsville on Friday and Saturday for a three-game series at Egnew Park, Lindsey Wilson Sports Complex, 928 Russell Road, Columbia, KY. Friday's action is slated for a 3pmCT start with Saturday's doubleheader set for NoonCT. Paul E. Stanley of Campbellsville, KY passed away on Monday, April 15, 2019. He was 86 years old. The funeral service will be held at 1pmET on Friday, April 19, 2019 at Parrott & Ramsey Funeral Home, 418 Lebanon Ave., Campbellsville, KY, with Dr. James E. Jones officiating. Burial will follow in Campbellsville Memorial Gardens. Visitation is requested from 11amET until 1pmET on Friday, April 19, 2019 at Parrott & Ramsey Funeral Home. The No. 6-ranked Lindsey Wilson softball team took two games against WVU Tech on Tuesday afternoon at Marilyn D. Sparks Park to wrap up their home portion of the 2019 regular season. The Blue Raiders (36-2) shutout the Golden Bears (17-23) 8-0 in game one and captured game two by a final score of 9-1 as they ended both games via run rule. Lindsey Wilson out hit WVU Tech 17-7 for the afternoon. Taylor Slade (9-0) got the start in the circle in game one pitching a complete game shutout, allowing just five hits and striking out 10. Kaylee Covey (1-0) picked up the win in game two after she went the full five innings, striking out four and allowing just two hits. The Blue Raiders are back in action on Wednesday when they hit the road to take on Cumberland (TN) at 1pmCT. Frankfort, KY - The Kentucky Real Estate Commission (KREC) announces a new online licensing process for all applicants for a real estate license. Applicants will now be able to apply and pay for their professional license through the KREC website krec.ky.gov. You're invited to join First Baptist Church, 847 Burkesville St., Columbia, KY, as they observe Pastor Daniel Murphy, Sr.'s 4th year anniversary on April 28, 2019, at the 11:30amCT service. Mable Long of Columbia died Monday, April 15, 2019 at her residence. She was 90 years old. Funeral services will be 11amCT on Thursday, April 18, 2019 at the Stotts-Phelps-McQueary Funeral Home, 210 Greensburg St., Columbia, KY, with Bro. Don Taylor officiating. Burial will follow in the Bearwallow Cemetery. Visitation will be on Wednesday from 3pmCT until 8pmCT at the funeral home and will continue on Thursday morning until time for the service. Lindsey Wilson baseball is slated to host No. 3-ranked Tennessee Wesleyan on Tuesday afternoon at Egnew Park, Lindsey Wilson Sports Complex, 928 Russell Road, Columbia, KY.
Tuesday's action is scheduled for 3pmCT for the single nine-inning game. The Blue Raiders (7-28) are returning to the diamond after dropping their weekend series against the No. 4-ranked Georgia Gwinnett. Lindsey Wilson fell in game one 19-2 on Friday followed by a 6-5 defeat and 15-5 loss on Saturday. Pete McKinney, 88, of Jamestown, KY passed away Sunday, April 14th, at the Russell County Hospital. Religious Services will be held at H.E. Pruitt Memory Chapel at 2pmCT on Wednesday, April 17, 2019 with Bro. Barry Bradshaw officiating. Friends may visit Wednesday after 11amCT. Interment will be in the Jamestown Cemetery. Pallbearers are: Terry Grider, Scotty Coe, Steven Hadley, Larry Humble, Jeff Perkins and David Hale. Adair County Judge Executive Gale Cowan�s office will be closed to celebrate Good Friday on Friday, April 19, 2019. She and her staff wish everyone a blessed and Happy Easter! COLUMBIA, Ky. - Four members of the Lindsey Wilson men's tennis team picked up Academic All-Mid-South Conference honors, conference officials announced on Tuesday. Camilo Erazo, Matthew Hunter, Zach McFall and Mathew Wells all earn the distinction for the first time in their careers. The Blue Raider student-athletes are four of 30 tennis players in the MSC to pick up the award. Billey Webb Bernard, 86, of Russell Springs, died Monday, April 15, 2019 in Somerset. Cremation was selected. Family requests that expressions of sympathy be made to the Russell County Honor Guard. (Cumberland County, KY April 16, 2019) - On Sunday, April 14, 2019 around 9:00PM CST, Kentucky State Police, Post 15 received a third party call reporting 49 year old, Tommy Thrasher of Burkesville was holding his wife and daughter hostage, refusing to let them leave. Upon units arrival Stacy Thrasher and her juvenile daughter were able to safely exit the residence and taken to a safe location. On Monday, April 15, 2019 at approximately 1:26PM CST, Trooper Allen Shirley arrested Tommy Thrasher one mile north of Burkesville on Scotts Ferry Rd and charged him with Unlawful imprisonment 1st degree, terroristic threatening 3rd degree, and menacing. - Subject line needs to say: "Service Day" - Brief description: Getting plastic debris out of the Town Branch. - Project location: start at corner of Montgomery and Hurt Street and follow the stream as it parallels Hurt Street, then veers off across the Arnold acres and the Waggener acre, to stop at Lynn's Service Center acres, where the stream goes under Jamestown Street. The stream goes on but I haven't personally checked the condition from there. - Send by email to lindseywilsonfootball@gmail.com. Coach Oliver says, "we are going to take requests via email for the next week, and then organize and communicate back regarding what we can fit into our schedule that day. It's possible that we won't be able to cover every project, but we'll see how it goes after the requests come in." Passion Week (also called Holy Week) takes place between Palm Sunday and Easter Sunday (Resurrection Sunday). Why is it called "Passion Week"? This name represents the passion with which Jesus willingly went to the cross. He did this to pay for your sins--the sins of all of His people. To study the biblical accounts of Passion Week, read the following chapters: Matthew 21-27; Mark 11-15; Luke 19-23; and John 12-19. The Adair County Ambulance Service Taxing District is accepting bids for parking lot repair work to be done on approximately 90 feet x 45 feet. Repair work would include removal and disposal of old blacktop surface and replaced with concrete 6 inches in thickness. Specifications on repair work can be picked up at the Adair County Ambulance Service Mon. thru Fri. from 8am-4pmCT. The Adair County Ambulance Service Taxing District board of directors will review and possibly award the bid at the regular monthly meeting on May 13, 2019 at 6pmCT at the Ambulance Services building, 906 Westlake Drive, Columbia, KY on the lower level. Did anyone bite you at work today? On average, nearly 15 mail carriers per day will say, "Yes." To ensure mail carriers' safety, dog owners must securely lock their dog in another room until a delivery exchange is done. If outside, dogs must be leashed at a distance from the mailbox. Mr. Terry Lane Thomas of Burkesville, Kentucky passed away Saturday, April 13, 2019, at his residence in Burkesville, having attained the age of 63 years, 7 months, and 27 days. The funeral service will be conducted on Sunday, April 21, 2019, at 2pmCT in the Memory Chapel of Norris-New Funeral Home, 601 N Main St, Burkesville, KY, with Bro. Gary Cash officiating. Burial will be in the Burkesville Cemetery in Burkesville, Kentucky. The family will receive friends after NoonCT on Sunday, April 21, until the funeral hour. Frankfort, KY - Secretary of State Alison Lundergan Grimes is reminding eligible Kentuckians that the deadline to register to vote in the upcoming May 21 Primary Election is Monday, April 22, 2019. Kentuckians can easily register and update their registration with GoVoteKY.com, the Commonwealth's online voter portal. County clerks' offices throughout Kentucky will accept online and paper applications until 4pm local time on the deadline. Mail-in voter registration applications must be postmarked by April 22, 2019. It's currently 42F at the Adair County Mesonet station. Sunny skies today with a high near 75F. Southwest wind 5 to 15 mph, with gusts as high as 26 mph. Tonight will be partly cloudy, with a low around 54F. South wind 6 to 9 mph. Wednesday will be mostly sunny again, with a high near 77F and south wind 6 to 11 mph. Wednesday night should be partly cloudy, with a low around 58F. South wind 7 to 9 mph. Casey County: No events Circuit Court. 53 events District Court. Taylor County: No events Circuit Court. 1 event District Court. --Robert Stone, Tuesday, 16 April 2019.